Heard about NACAC’s new membership model, but not sure what it means for you? 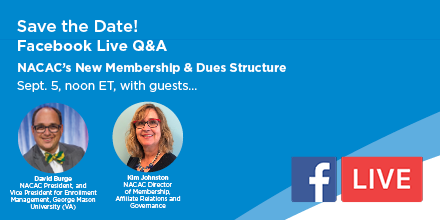 We’ll be broadcasting via Facebook Live at noon on Wednesday, Sept. 5 with NACAC President David Burge and Kim Johnston, NACAC’s director of membership, affiliate relations, and governance. Tune in to learn what NACAC members will be voting on at the national conference and how the model will make it easier to join NACAC, increase the diversity of the association, and expand access to our resources to more college admission professionals. Have questions about the model? Ask them during the broadcast using the video’s comment section or submit them ahead of time via email. Previous PostAdvocates Spread the Word About Afterschool Meal ProgramNext PostHey, Alexa: What Time Does the Dining Hall Close?